The new Michael Page Employee Intentions Report reveals that most workers have faith in the strength of the Hong Kong economy. Completed in June, the online survey polled entry-level to senior-management professionals on salary expectations, confidence in the job market and general employment outlook. Of the 700 respondents, 42 per cent rated the current job market as strong. Some 40 per cent also indicated they are likely to change jobs within the next six to 12 months, with over a third of those who wished to move citing career progression as their primary reason. Half of those surveyed also said they would ask their current employer for a pay rise. In light of these results, employers will likely need to look at ways to hold on to staff over the next year, says Anthony Thompson, senior managing director for Hong Kong and Southern China at Michael Page. “Employers need to focus on retention and will be expected to enter into salary negotiations to keep top talent – that is, individuals with the experience and knowledge to drive the business forward,” he says, adding that jobseekers are paying special attention to career development plans, something hirers should be wary of. Employers should also be mindful of the fact that average salary rises look set to grow. Over a third of respondents are aiming for a rise of 6-9 per cent, far outpacing expectations from the same time last year. However, Thompson adds that while remuneration is important, there are a number of other ways employers can encourage top talent to stay with them. “We increasingly find that candidates are focused on their career path and not just what is in it for them now,” he says, pointing to the impact of career progression on willingness to stay put. Part of what’s fuelling the higher expectations, he suggests, may be the current wealth of job opportunities. Much of this, Thompson says, is attributable to the strength of the mainland economy, which is prompting many firms based there to expand their operations in Hong Kong. “There is no doubt that China’s economic strength and continued growth are a real positive for the employment market in Hong Kong. Asia overall is performing well compared with most other markets,” Thompson says. The only exception may be the financial services sector, which continues to be hit by uncertainty, especially in Europe. Employees can probably feel less guilty about tardiness or web-surfing during office hours. At least that’s the implication of the results from a Regus global survey suggesting that flexible working conditions can help increase worker productivity and, by extension, company profit. The survey, which covered more than 16,000 senior business managers, is one of the largest of its kind to validate the correlation between flexibility, productivity and profitability. Among those polled in Hong Kong, 75 per cent said that flexibility boosted productivity, while 72 per cent agreed that it could help increase revenue. Hans Leijten, Regus vice-president for East Asia, attributes the gains to enhanced employee morale. “Flexible work gives people power to decide when and where they work. This helps them to plan and execute their work more efficiently and to reduce the time it takes to commute and to actually do the work,” he says. 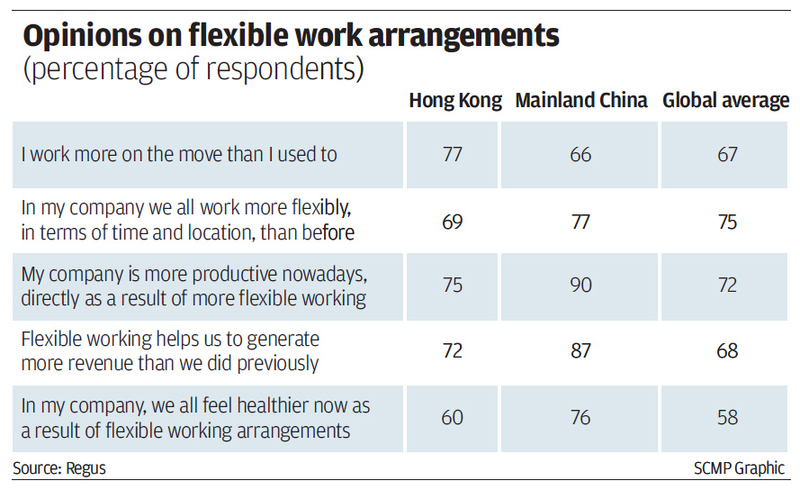 At 67 per cent, a significant portion of Hong Kong respondents also reported feeling more energised and motivated, thanks to flexible work arrangements. Some 60 per cent even claimed to feel healthier, implying cost-savings on healthcare premiums. And with many firms still reluctant to commit to large pay rise this year, flexible arrangements can be used as an employee retention tool, Leijten adds. “Staff who work flexibly report feeling healthier, more energised and more motivated, which is good for staff retention and morale,” he says. This view is echoed by Martin Cerullo, the global director of resourcing communications at Alexander Mann Solutions. “The ability to work flexibly makes up an important part of the overall employee value proposition. Employers who allow staff to work flexibly are really saying, ‘I trust you to make the decisions about the time and working location that are right for you.’ Naturally, this sends an appreciative message,” he says. Leijten notes that the Regus survey findings help reaffirm a common practice in Hong Kong, particularly among smaller nimbler companies where implementation is easier. Despite a subtle sense of apprehension regarding the economic situation in Europe and the United States, things are looking up for those in the travel and hospitality industry. A recent survey by TMS Asia-Pacific has found that travel and hospitality executives in Hong Kong boast the highest average salaries in the region. This was the second year in a row that Hong Kong topped the survey, and also the second year that Singapore ranked in second place. But the situation across the border is looking slightly worse, with salaries dropping over last year, largely due to rising labour costs, inflation and a steadily appreciating yuan. Commenting on the dominance of the Hong Kong market, TMS CEO Andrew Chan noted that Hong Kong has seen an unprecedented number of monthly arrivals recently – the bulk of which he attributed to visitors from the mainland to the north. “The romance of travel has really bitten mainland China, and this is propping up the region,” Chan says. “In Hong Kong, there were record arrivals in short-haul flights, and a lot of these were from carriers that operate between Hong Kong and China,” he says. The survey also found that – in contrast to previous years – the number of employees working in their current companies for 12 months or less has increased by 40 per cent, which “suggests that workers are starting to shop around a bit more,” according to Chan. Meanwhile, the growth of new hotels and regional offices in the region has also driven up recruitment and competition for staff. “The war for talent is driving up wages. So, while companies in Hong Kong are making more profit, much of it is being passed on to employees in the form of higher salaries,” says Chan. To combat the situation, more companies are focusing on employee-retention strategies and creative ways to engage their staff, while also offering more flexibility and training to motivate them, Chan adds. As to how the continued economic uncertainty might affect these trends, Chan says that the focus is still on recruitment for now, but that companies may start to look at retrenchment if the situation in Europe gets out of hand. While this is not expected to have a hugely adverse effect on travel in the region, Hong Kong could be more greatly affected, due to its position as a business hub in the Asia-Pacific region, Chan notes. In terms of the effect on travel industry salaries, Chan says that a European crisis would not have any drastic impact on the region at large. But he says that Hong Kong could be more shaken due to its role as a centre of trade.